As a traveler headed to a new location, there are usually two or three options when searching for an accommodation, all with their own unique set of tradeoffs: there is the hotel, the hostel, and in some places bed and breakfasts. While many people may be happy with these options, they leave a lot to be desired for others, which is exactly why AirBNB came onto the scene. In today’s addition of Businesses with Bang!, we look at how this little startup could shake up the entire hotel industry and change the way we travel. Whether you travel for business or pleasure, there are always a number of factors that affect your experience – some of them are in your control, others aren’t. One of the top factors in determining the outcome of your travelling experience is your accommodation. Thanks to the Internet and social networks, it has become a lot easier to find a great place to stay; however, for those who have outgrown hostels, are sick of the traditional hotel experience, and can’t afford a bed and breakfast, there have traditionally been very few options. Enter AirBNB. AirBNB (short for Air Bed & Breakfast) is an online network that connects travelers to a global network of accommodations offered by locals. Locals from around the world list a room in their place, or the entire place, on the AirBNB website, giving travelers an opportunity to stay like a local. Whether you are looking for a couch in a college suite, a luxury condo in downtown, or a castle in the countryside, chances are you will find it on the site. AirBNB was started in 2008 by Brian Chesky and Joe Gebbia in San Francisco, when they saw an opportunity to provide out-of-town conference attendees with a new option to overpriced hotels. They realized that there were probably hundreds, if not thousands, of people scattered throughout cities around the world that would be willing to rent out an empty bedroom in their house or apartment for a fair price. And they imagined that thousands of travelers would jump all over the idea of staying with locals for a fraction of the cost of a hotel. As I recently saw first hand, they were right. Last month I needed to make a business trip to Seattle for four days. The thought of spending five nights solo in a budget hotel didn’t overwhelm me with enthusiasm – and for the company, five nights in a hotel isn’t even economical. After hearing about AirBNB through the grapevine of the Internet, I thought that it would be a good chance to test it out, so I booked a room. The room was in a great location, the host was incredibly knowledgeable and friendly, and the price was less than half what hotels in the area would charge. And the benefits extend beyond that; rather than feeling like a time-crunched tourist, I was able to learn about what areas to go to, what areas not to go to, and how to get around as cost-effectively and quickly as possible. I was pointed to all the local hotspots for food, music and whatever else I needed. The result was a much better trip, from both a business and personal perspective, than I ever thought possible. While it might seem like a bit of a wild concept, many people are buying in. The obvious concern for people on both sides of the transaction is trust; for renters, there is the concern of letting a person you have never met stay at your place, while for travelers, the concern is whether or not the place will be as advertised. Those problems, however, can be overcome in large part due to the advent of social networks, which help create a high level of transparency and accountability, as both renters and travelers can rate and review each other for everyone else to see. Up to this point, AirBNB has been a wild success. 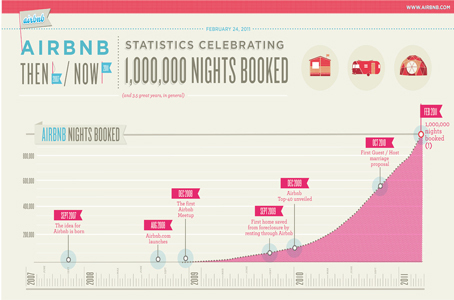 Just last month they had their one millionth booking, which is even more incredible when you consider that they had only 100,000 bookings in January of 2010. People on all sides of the equation are happy – travelers save money and get a better experience, renters make money and get to meet new people, and AirBNB, who makes 10% on every transaction, is able to scale out their network to new locations and add more staff. The most intriguing part about AirBNB, however, is how it could reshape the entire way we travel. Over the long run, as more and more people try out the service and become members of the site, network effects will start to take place. With the speed of communication that social networking enables, the word about certain places will get out and make them increasingly more popular to stay, which in turn will make renting both an exciting and profitable experience for owners. As they reveal their experiences to friends in their networks, more people will leap on board to rent out a room. If both travelers and renters start to see AirBNB as the way to go, a hospitality industry transformation would ensue. While this scenario might seem like a fantasy, it’s clear that services like AirBNB are in high demand. People want more personalized, friendly experiences, and they want to pay fair prices to get them. Sites like AirBNB make that desire a reality.